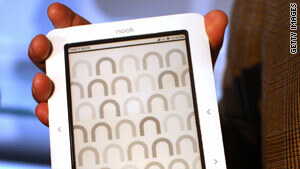 The announcement of Barnes & Noble's Nook e-reader was one of several big tech news items this week. Editor's Note: In this new weekly feature, CNN.com highlights five recommended Twitter feeds about a hot topic in the news. Let us know who we missed in the comments section. (CNN) -- This has been a wild week for tech news. Google is going to stream and sell music. Facebook has music now, too, and new virtual gifts. Bing and Google added Twitter to their search functions. Apple has a new mouse. Microsoft has a new Windows operating system. There's so much interesting tech news out there that it's easy to miss something. Luckily, there are TONS of great tech writers to follow on Twitter, where you'll catch all of the updates and behind-the-scenes info in real-time. Manjoo, a writer at the online magazine Slate, is good at spotting below-the-surface tech trends that others miss. His Twitter feed is both newsy and irreverent, with random asides like "Cambria is quite a nice typeface" and "Need to find a way to tell my editor that my story will be late because of #balloonboy. ... Oh wait, he's probably reading this." For a look at how technology is changing lives all over the world, Morozov is a good bet. He writes the "Net Effect" blog on Foreign Policy's Web site and offers pithy observations about how the Internet and social media intersect with international diplomacy and policy. It sounds heady, but Morozov makes the topic accessible and interesting. Cutler's coverage of virtual worlds, social media and online culture at VentureBeat is top-notch, and her largely unfound Twitter feed catches the big tech talking points of the day in a timely and interesting fashion. Ostrow is editor-in-chief at Mashable, a blog that covers social media and pop technology news. His Twitter feed tends to have more of a behind-the-scenes and personal flair than the blog's main Twitter handle, @mashable. The founder of GDGT, a gadget blog, Block is an excellent source for reviews of new devices, like the Nook e-reader, and commentary on the tech industry at large. And he has a cool hat in his avatar photo. Sample tweet: Just realized I no longer have any email addresses in use which are not hosted by or residing on Google's servers.